Free Love - "Official Bootleg Vol. 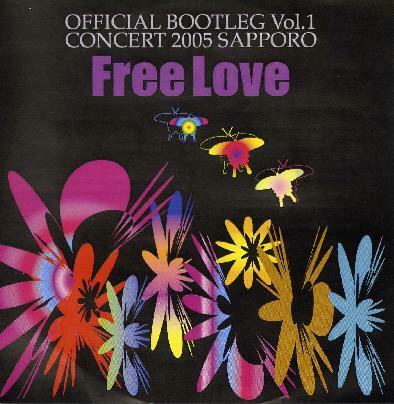 1"
This is the new Japanese band, Free Love's, first live release and it was recorded in Sapporo in October 2005 and features 4 tracks (34 minutes), all from the Apocalypse CD but in quite different free form jammed out versions. This sounds like a very good audience recording and there is a bit of distortion at times but overall the sound is excellent. The CD begins with Long Way to Kashmir, which is a shortened version of the classic Led Zeppelin song but instrumental here and very much focused on the guitar work and is very psychedelic. This leads straight into Spiral, which like the title suggests spirals and loops and the band keeps the groove going. The Maze of Psycho is next and begins as a jam, as the guitarist places a classic guitar riff before the track begins. The band really rock out and there is a great organ solo at the end of this track before the band close the CD with the Led Zeppelin inspired Shangri-La, which is a bit shorter than the studio version but very cool and begins with a Japanese string instrument (simulated on the keyboard, I assume) before the track kicks in. This short CD gives the fans of classic psychedelic rock a good glimpse into what this band sounds like and can do live.